Café Olé returns to its summer residence at Space Ibiza this Saturday 16th June with a new party that plans to transform the Playa d’en Bossa club into a place where anything can happen. The actress and icon of extravagance, Rossy de Palma, will be in charge of leading each of Motel Café Olé’s customers to their rooms. This season the Motel Café Olé night adds to the program of three other rotational Saturday parties at Space - Burlesque Café Olé, Olé Back To Disco Café and Café Olé is Pervert. 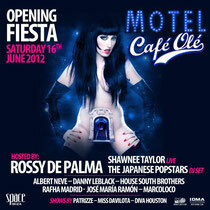 Motel Café Olé will open with a cast of international stars including a DJ set from The Japanese Popstars, American singer Shawnee Taylor, the recent voice on many of Erick Morillo’s latest hits, and the aforementioned Rossy de Palma - iconoclastic actress, Almodovar girl, a regular at Paris fashion shows, singer and now DJ. All will be accompanied by the usual artists, such as singer Patrizze and the couture performers Miss Davilota and Diva Houston. Also on will be House South Brothers (Paul Kopanos and Manuel Moore), Jose Maria Ramon and Café Olé residents, Danny Leblack, Rafha Madrid, Albert Neve and Marcoloco. These last two, together with Danny Ávila and Borja Delanera, are Café Olé’s four new signings as residents for this season, joining Kopanos, Leblack and Madrid on the permanent team. In addition, every Saturday we will have the Ibiza Global Radio team hosting the Sunset Terrace with its entire team of DJs to kick off the night with the best outdoor music. Other international DJs who will be performing at Café Olé are Taboo from Black Eyed Peas, Roger Sanchez, Antoine Clamaran, Kaskade, Francesco Farfa, Chus + Ceballos, Dyro, Eddie Thoneick, David Penn, Carlos Fauvrelle and Dyro. Other acts scheduled include performances from Boney M, Amanda Lepore, the world's most famous transsexual, and singers Crystal Waters and Ultra Naté, who will attend Café Olé a second Saturday to debut as a DJ in Ibiza. There will also be performances by celebrities such as the versatile artist Vinila Von Bismark, model Bimba Bose, and designer David Delfin.